Dufuna canoe, Nigeria. When a local heardsman dug a well for his thirsty cattle, he found an ancient logboat. It was excavated on land in 1998 together with the Deutsches Schiffahrtsmuseum, Bremerhaven. Dated to ca 6500 BC and 8.4 m long. Western Ledge wreck. 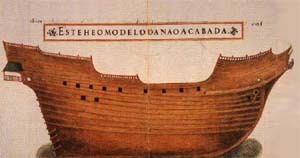 Unidentified Spanish ship from late 16th century, in the Bermudas. Ref IJNA 22.2 1993. São Bento. Portuguese ship sunk off South Africa in 1554. Found in 1968 and excavated. Ref British Museum Encyclopaedia of Underwater and Maritime Archaeology. Revenge. English naval 500-ton galleon built in 1574. Commanded by Sir Francis Drake against the Spanish Armada in 1588. In 1591 she was commanded by Sir Richard Grenville, trying to attack the Spanish flota (convoy) with American gold and silver. At the Azores the Revenge met a superior Spanish navy unit. After two days of battle she was captured by the Spanish, but sank in a storm off Terceira shortly afterwards. The wreck has not been located. In 1972 Sydney Wignall searched for the ship but found little more than a Portuguese bronze gun. Ref: Ian Wilson, Undiscovered (1988) . Chagas, Portuguese nau sunk in battle near the Azores in 1594. The wreck has been searched for by treasure hunters. Angra D wreck. Remains of a very large ship in Angra Bay, Azores. May have been 40 m long and sunk around 1600 AD. Mauritius. Dutch VOC ship built in 1601 or 1602. Loaded with 18,000 zinc ingots, wrecked in 1609 off Gabon, West Africa. Discovered in 1985, excavated by Michel L'Hour and Luc Long. Ref British Museum Encyclopaedia of Underwater and Maritime Archaeology. Sea Venture, English ship carrying colonists heading for America. Caught by a storm and lodged on a reef off the Bermudas in 1609. Everybody survived but the ship had to be abandoned. This incident may have inspired Shakespeare to write The Tempest in 1610. The wreck was discovered in 1958 by Edmund Downing and excavated from 1978 by Allan J. Wingood and Jonathan Adams. Finds are exhibited at the Bermuda Maritime Museum. The painting by Jonathan Adams shows Sea Venture with pinnace in tow. Ref IJNA 14.4 1985. San Antonio. Spanish ship sailing from Cartagena, Colombia, with gold, silver and tobacco. Sunk in 1621 in the Bermudas. Investigated by Mendel L. Peterson. Ref G.F. Bass: A History of Seafaring. Santíssimo Sacramento. Portuguese ship sunk at Port Elizabeth, South Africa in 1647. Found in 1977 and excavated. Porcelain is exhibited at the Port Elizabeth Museum. Ref B. M. Encyclopaedia of Underwater and Maritime Archaeology. Oosterland. Dutch VOC ship sunk off Cape Town, South Africa in 1697. Discovered in 1988. Slot ter Hooge, Dutch VOC ship sunk off Madeira in 1724. Only 33 people out of 250 survived the sinking. In 1974 large quantities of silver were salvaged from the site on 18-22 m depth by treasure hunter John Stenuit, supported by the National Geographic Society. No archaeological report was ever published. Ref B. M. Encyclopaedia of Underwater and Maritime Archaeology. Grosvenor. English East Indiaman going from Ceylon. In 1782 she sank off the Pondoland coast, Cape province, South Africa. The lost gold and jewellery was valued at more than 2 million pounds in money of the time. Ref Kenneth Hudson: The Book of Shipwrecks (Macmillan 1979). HMS Pallas. English 36-gun frigate sunk off the Azores in 1783. Discovered in 1998 and investigated by Centro Nacional de Arqueologia Subaquática nos Açores. Link. Brederode. Dutch VOC ship sunk off South Africa in 1785. Apparently located in 1998 or 1999. Cargo from the apparently intact wreck is to be salvaged by the Aqua Exploration company . La Méduse. French frigate heading for Senegal in 1816. Grounded off Senegal in. During the following days most of the survivors died in horror, suffering from sun, thirst, and cannibalism on the raft. This resulted in a famous painting at the Louvre. The wreck was located with magnetometer in 1980 and investigated. SS Central America. Side wheel steamship, sunk in 1857 in the deep waters off the "Graveyard of the Atlantic" off the South Carolina coast, loaded with 21 tons of gold from California. The wreck was located by Tommy Thompson in 1988 on 2400 m depth. Much of the gold was salvaged by Tommy Thompson using an ROV. Also, some books and newspapers were found intact in the wreck. Described in America's Lost Treasure by Tommy Thompson. SS Republic. Steamer going from New York loaded with gold. Sunk in storm in 1866 on 500 m depth, ca 150 km south-east from Savannah, Georgia, USA. Recently located and treasury salvaged. Gold coins are now for sale. Vega. Wooden-hulled bark ship with a 60 hp steam engine. Built in 1872–73 as a polar research ship for Swedish explorer A.E. Nordenskiöld. Successfully passed through the Northeast Passage north of Siberia, from Norway to Japan, in 1878–79. The ship sank in c 400 m depth off the west coast of Greenland in 1903. There are plans to locate and raise the ship. SS Norge. Steamer built in Glasgow on 1881. On 28 June 1904, she struck Rockall off the Hebrides in foggy weather and sank. Of the 727 passengers and 68 crew, 582 passengers and 45 crew were lost. Titanic. 269 m long, 46,000-ton passenger ship, sister ship to Britannic and Olympic. Built in 1909-1911 by Harland and Wolff in Belfast. Struck an iceberg during its maiden voyage in 1912, and sank in 2½ hours, in the North Atlantic. 1517 people died because of insufficient lifeboats. By coincidence the accident was very similar to that outlined in Morgan Robertson's 1898 novel Futility. Found in 1985 on 3750 m depth by Dr Robert Ballard and the French Infremer institute. The Ballard team did video and photo documentation. From 1987 another workgroup, Titanic Ventures, later renamed, RMS Titanic Inc, has salvaged hundreds of artefacts, which have been displayed in exhibitions. This company has claimed the wreck and by court appointed "salvor-in-possession". R.M.S. Carpathia. This was one of the steamers that rescued survivors from the Titanic. In 1918 she was torpedoed and sank off the south coast of Ireland. Five people died and 215 escaped. In 1999 the wreck was located on 170 m depth. Egypt, P&O liner. In 1922 she collided with the freighter Seine, and sank in 120 m depth off the French coast. On board was £ 1,000,000 worth of gold. Most of the gold was salvaged in 1933-35. Salvaging objects from this depth was a sensation. HMS Hood. British battle cruiser sunk by Bismarck in the North Atlantic in 1941. Ca 1400 died when the ship sank. Only 3 survived. Bismarck. 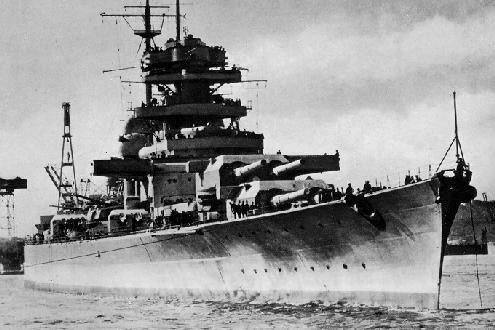 German 247 m long 50,000-ton battleship with eight 38 cm guns, top speed 30 knots, and a 2100 men crew, built in 1939. Bismarck sank HMS Hood in May, 1941 in the North Atlantic. Shortly after that, off the French coast, Bismarck was attacked by British torpedo-carrying aircraft. One of the torpedoes (too weak to penetrate the hull) got stuck in Bismarck's rudder without exploding. The steering was jammed and the ship doomed to spin in circles. After receiving thousands of shells Bismarck sank. Whether she sank from the shells, or was scuttled by her own crew remains disputed, but no matter which, the Germans lost the battle. 115 men survived. Even if the ship had not been sunk it wouldn't change history. A single ship like the Bismarck would only dare occasional hit-and-run attacks in the Atlantic. The wreck was discovered in 1989 by Dr Robert Ballard on 4700 m depth. The hull was surprisingly intact, which might support the theory that the ship was sunk by its own crew rather than surrender it. In 2002, James Cameron filmed a documentary on and about the wreck. The documentary has also been criticised. Described in National Geographic, Nov 1989. HMS Ark Royal. British aircraft carrier sunk by German sub U-81 off Gibraltar in 1941. Located in 2002 on 1100 m depth, ca 10 km off Gibraltar. I 52. This giant Japanese submarine was 107 m long and loaded with 2 tons of gold for Germany. The coded messages about the transport were decoded by the Allies and the sub was sunk in 1944 by a US air attack. Located by Paul Tidwell in 1995 in the Atlantic on 5000 m depth. There are plans to raise the sub and recover the gold. Ref National Geographic, Oct '99. "U-who". This German sub was located in 1991 on 70 m depth off the North American coast. She remained un-identified for years, nicknamed "U-who". She is now identified as U-869, which apparently torpedoed itself in February 1945. Ref Dagens Nyheter, 3 June 2003. USS Scorpion. US nuclear sub built in 1959. Lost with 99 men in the Mid-Atlantic in 1968 and the reason remains a mystery. Resting on 3600 m depth, no archaeological significance.